Have you ever stopped to think about how that fresh produce gets to your local market in the middle of winter, in the mountains? Or for that matter, how does the produce get from the farm to the distributor? Or what about the shipping containers that arrive by sea, or by train at port? What happens then? How does the freight get to its final destination? More than likely, a trucker was a major part of making those products available to you, 24 hours a day, 7 days a week, 365 days a year. In appreciation of truck driver's dedication and commitment to safety, the California Trucking Association in collaboration with the California Highway Patrol and supporting sponsors hosted a free lunch for all drivers earlier this week. 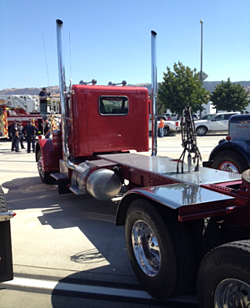 CHP and California Trucking Association members from the Bay Area and Central Coast Units hosted these events across the Bay Area over two days. 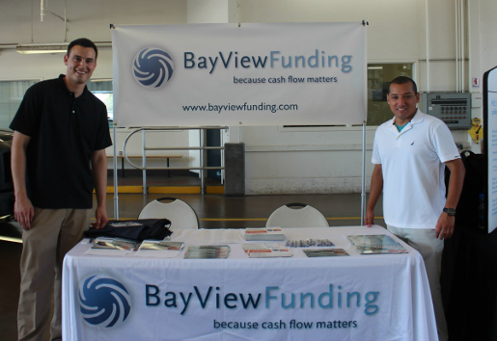 In addition to a free BBQ Tri Tip lunch, information booths for the California Truckers Association, Prepass, DMV and other CTA supporters, including Bay View Funding, were at the event. These lunches were clearly successful, with the exchange of commercial information, camaraderie, great food, and exhibits. We are proud to have been a part of this show of support. Jesus and Gil on hand to answer your cash flow questions. The trucking industry continues to be the backbone of the American economy, and that’s why at Bay View Funding, we work hard to keep our truckers in the driver’s seat and their cash rolling in. From Freight Factoring to Invoice Factoring, our experienced staff are among the best in the industry and are committed to your success. Contact us today. Be on the road tomorrow.